If you want to rest for a while from your housework, you can rely on our domestic cleaners who are at your disposal in Maida Vale to do it. They will provide the necessary cleaning and housekeeping tasks that you require in your home. Whether you need help with the ironing, laundry, throwing of the rubbish-bins or cleaning of your rooms, we can help you. Our domestic cleaners will ensure the hygienic atmosphere in your home by providing the housekeeping and cleaning work which needs to be done. We can provide thorough cleaning, tidying and sanitizing of the rooms in your home. Our domestic cleaners will do the tasks which you need and pay more attention to the rooms and areas that require better cleaning. They will sweep the floors, mop and wipe them, polish the dirt and grease from the cooking appliances, vacuum clean the carpets. Use our professional help to maintain your house and flat perfectly clean and hygienic. Our domestic cleaners use safe for the environment cleaning products, the necessary cleaning machines and tools. They will sanitize the living areas, lounge, kitchen, bathroom, toilet, bedrooms and hallway in your home. You can use the professional help of our hard-working domestic cleaners who work in the region of Maida Vale. The domestic cleaners who work for us are fully insured, qualified and have the necessary relevant experience. They can provide one off and regular cleaning sessions, coming at a suitable day and time once a day or week, fortnightly or monthly. Call us and schedule the cleaning which you need and it will be implemented in a preferred time. 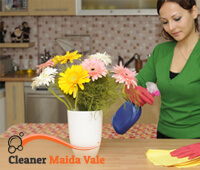 We will send any of our domestic cleaners who work in Maida Vale straight to your address.